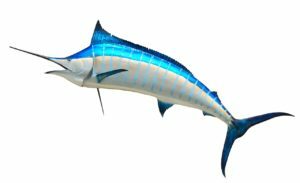 Do You Know About the Blue Marlin? South Floridians may need little introduction to the Atlantic blue marlin. With its pointy and elongated bill, it can be easily mistaken for a swordfish. In fact, similar to the swordfish, the blue marlin uses its bill to catch its prey by stunning, injuring, or even killing it. The blue marlin also uses its bill as a tool to slice and dice across schools of fish. A blue marlin spends a large portion of its life swimming quietly in the open sea nowhere near land. In regards to size, females tend to be larger than males, as much as four times in some cases. The fish can be over five feet in length while weighing well over 300 pounds. Like other billfish, it has a very cool ability to change colors rapidly if necessary. Even so, the blue marlin is known for largely keeping its blue-black color with a silvery white underside. A blue marlin that’s reached maturity can swim around the seas without having to constantly watch out for predators. However, certain sharks such as the great white or shortfin mako are exceptions. In regards to maturity, male blue marlins are able to live up to eighteen years while females can live significantly longer at 27 years.